Count on Original HP PageWide cartridges for printing professional-quality color documents. Get consistent quality from this cartridge designed for the HP PageWide Enterprise Pro 452dn, 452dw, 477dn Multifunction, 477dw Multifunction, 552dw, 577dw Multifunction and 577z Multifunction. 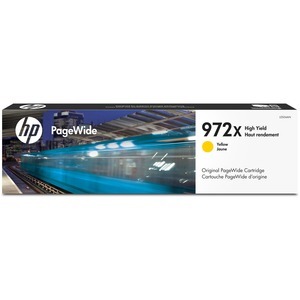 Original HP PageWide cartridges are precisely engineered to match the high-speed performance of HP PageWide Enterprise printers and MFPs and to deliver fast, consistent results. Intelligence built into Original HP cartridges and printer continuously optimizes quality and reliability. Durable documents are water-resistant, smear-resistant and fade-resistant. Easily replace cartridges in a snap and tackle high-volume print jobs without interruptions. HP 972X cartridge makes printing easy so work flows smoothly. Cartridge yields approximately 7,000 pages.